I’m Davie McGirr and by day I’m a user experience designer and Principal at RoaringUX with a focus on digital strategy, service innovation design and product design for the health and social care sector – that’s a mouthful sorry. It has some relevance to Seven Songs I guess because I’m involved trying to deliver healthcare in new ways – ways that are more efficient, more patient-centred and more integrated. I work in partnership with health and social care providers to re-design services, refine care pathways and improve business processes. My personal goal is to help organisations deliver integrated digital healthcare and help turn patients from passive to active participants in their care. That’s the big idea anyway. More importantly I’m a husband and father of 2 grown up children and we live in Knowl Hill Common, which is between Maidenhead and Reading in Berkshire. I’m from Ayrshire originally and up in Scotland quite often. I’m not usually one to put my head above the parapet but that changed in March 2014. I have a passion for acoustic music and the acoustic guitar. I love Country Blues, Americana, Scottish Music, British Folk. 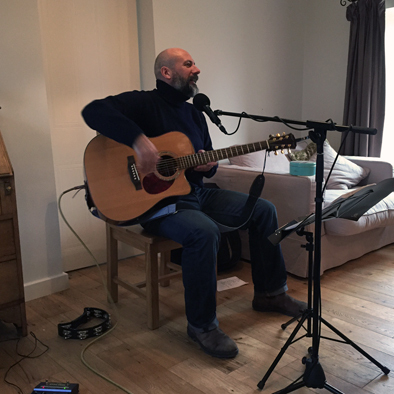 I play guitar pretty well and sing OK – some folk say I have a good voice but then this all for charity so everybody is very charitable. All I’ll say is that after nearly a year of Seven Songs, I’m sounding better. Seven Songs is raising money for the Alzheimer’s Society. The basic idea is that I play seven songs in people’s living room for half an hour or so and then go. Nothing special needs to be arranged and I don’t mind how many people are in the audience… one is fine although that’s a wee bit freaky… I’ve played to couples… and dogs… loads though. 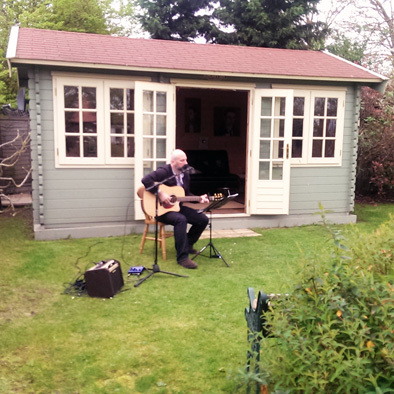 People who host a Seven Songs event though tend to invite friends or it’s at a dinner party or birthday party in the garden. I’ve also played in pubs and cafes. But it’s the same thing, I turn up and I play for however long is appropriate and I try not to outstay my welcome. I have a Just Giving site but I find most people like to donate cash and give it to me. I have a tin which I use to collect and I put it up onto the Just Giving site as soon as I can. This is the important bit… all donations go the Alzheimer’s Society (there are some minimal costs for using Just Giving but that more than makes up for the service they provide). I do not take any expenses for travel etc. Get in touch and let’s arrange a Seven Songs. It’ll be fun and I’ve been practicing. Contact me either by email at davie.mcgirr@gmail.com, through Seven Songs on Facebook or through my LinkedIn pages.